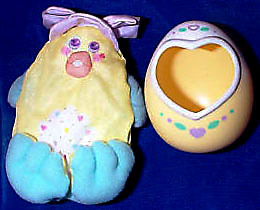 Description: Dazzle Duck is a large Smooshee duck from the 1989 Smooshees Easter Assortment. This duck was sold with a Easter egg that she can be smooshed into. Designed for children ages 4 years and older. FPT16345 - Dazzle Duck - Large Smooshees duck with a yellow body, an orange beek, small blue wings, and yellow legs with blue pads on the bottom. Duck has a white purple satin hat and bow on top of her head. She has a white tummy with tiny multi-colored dots and heart shapes. Dazzle has a blue heart-shape around one eye, and a red heart beside the other eye. FPT16346 - Yellow plastic Easter egg with a heart-shaped opening that Dazzle Duck can be smoosheed into. The egg has a purple heart and green leaves above and below the heart-shaped opening.